The Intranet Blueprint © 2013 is an all encompassing plan for assessing, planning and implementing a successful intranet. Our model for success, the Nexus of Intranet Success, is one that has been built over many years on the strength of dozens of projects. Intranet Blueprint encompasses two distinct phases: Assessment and Planning. Assessment serves two important functions: it documents the needs and requirements of the user population and those of the business and its stakeholders while aligning project goals with corporate goals and objectives. 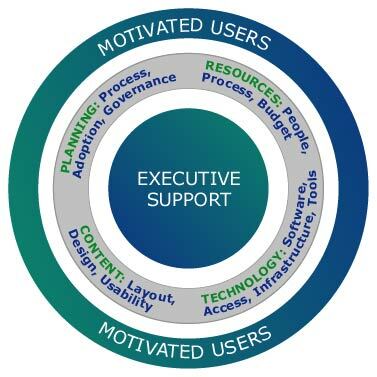 This phase includes a comprehensive intranet evaluation and gap analysis along with business requirements and stakeholder interviews, user reviews, surveys, focus groups, technical infrastructure analysis, and benchmarking against other leading intranets and intranet portals. The output of these phases constitutes the Intranet Blueprint for guiding the implementation of the intranet or portal and the underlying governance and technology foundation. The Blueprint contains the map and intranet action plan supported by information gathered throughout the course of the project including user research, benchmarking, wireframes, information architecture, technology recommendations, an implementation roadmap, and design concepts. Prescient’s experience and knowledge of intranets and portals is unsurpassed by any firm in its class. Our clients include HSBC, Mastercard, Nintendo, Pepsi, Royal Bank (RBC), PNC Bank, Sodexo, Toshiba, WestJet and dozens of others. For more information on the Intranet Blueprint, please contact us directly.